Mike came back to us sooner than later in his quest for making his NA complete. He added a set of BDE Intake Cam Gears and we then added a pair of the BDE Bullseye Exhaust Cam Gears. After a few hours on the dyno and tweaking all 4x cams we ended up with nice gains where it counts! 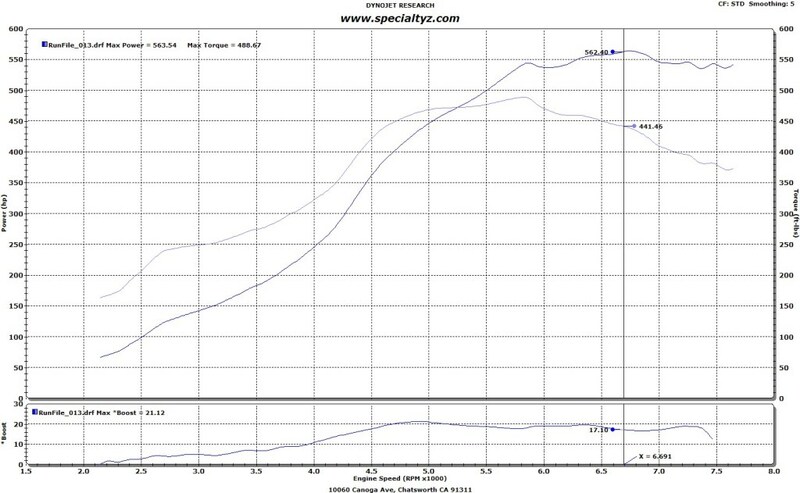 We gained 26 torque and 21 whp at 4100 RPMs! Much better all-motor response! German has one sleeper of a Z32. Originally this Z started life as an NA and recently it was converted to a TT. When it originally came to SZ it had what I call the “generic ricer boy” modifications. Don’t get me wrong, a front mount intercooler has its place on many cars but on a Z32 90% of the units out on the market are garbage. 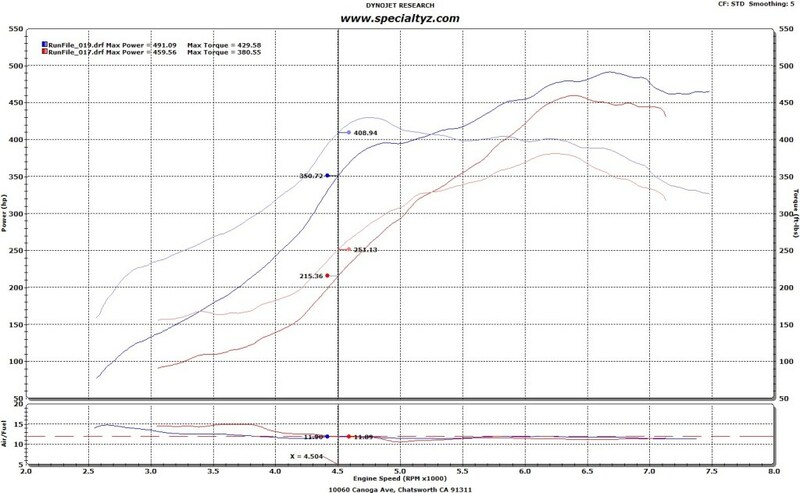 This Z had a Greddy 3-Row FMIC which is actually a nice core but it doesn’t stack up to the Ash Massives. The FMIC adds piping length, blocks airflow to the radiator, engine oil cooler, air filters (if not moved to SMIC location), and does not retain the engine’s crossflow design. 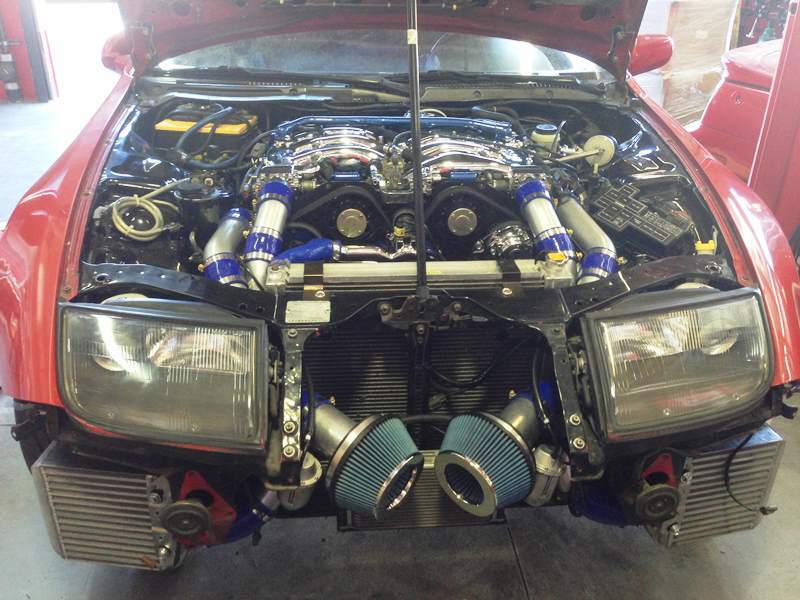 The Z also came equipped with GT2860RS turbos, JWT 500 cams, and built shortblock. Back in 2011 when German first brought us the Z we made many recommendations to improve his overall package. Fast forward to 2013 and we had our chance to take action. We went to work with removing the Greddy FMIC and replacing it with Ash Massive SMICs, Ash 2.5″ IC Piping, Ash Inlet Piping, and Z1 58mm throttle bodies rounding out the breathing. We installed a set of HR\VVHR JWT POPs for air filters and two dummy MAFs. We’ll get to that later. The Z was running fixed solid intake cam gears, we yanked them out, added VTC solenoids and a set of BDE intake cam gears to bring back Nissan’s awesome variable cam timing. On the exhaust side we had nothing to change, it already came to use with our SZ 5-Bolt 3″ down pipes, test pipes, and a B&B catback finishing off the tunes. German brought us a Snow Performance Water Injection kit. We love what water injection brings to the table by lowering detonation thresholds and cooler intake temps to keep heat soaking down. We can also make more power. This is where it can get hairy. Without the proper failsafes in place, that added power may bring trouble. A tune made to extract power from water\meth means more boost than one would run on regular pump fuels. If no water\meth gets injected and the boost is up you can destroy a perfectly good engine. So in order to combat this, Snow Performance’s Safety Injection box was added along with a solenoid to bypass the boost controller’s solenoid. We added a switch to also turn the system OFF\ON. The kits come with instructions to always be ON. We like the ability to turn it OFF\ON with the flip of a switch. We used the factory rear mounted WW reservoir to keep the Snow Performance Boost Juice stocked up and loaded. A low fluid sensor float was added to let the driver know if the system is getting low on fluid. After the reservoir we added a solenoid to keep boost juice from making its way into the engine drawn from vacuum or from getting pushed out due to boost. The intake manifold was replaced with a beautifully finished chrome piece along with a chromed CAS, bracket, and water pipes. The intake manifold was ported and polished to add the new Z1 throttle bodies. We cleaned up his PCV breather system. Exhaust cam gears were adjustable so we tweaked them for optimal power throughout the entire powerband. The reason we used dummy MAFs was that the MAFs services were no longer required. We installed an AEM Series 2 ECU to replace the Nissan ECU and MAFs. I always regret not taking a ton more photos. Especially to show the before and after much better. Along with all the detail, quality of work that goes into everything we do here. You can see almost everything is buttoned up and ready to go. No one would know any better to what this Z has cooking underneath its bonnet. 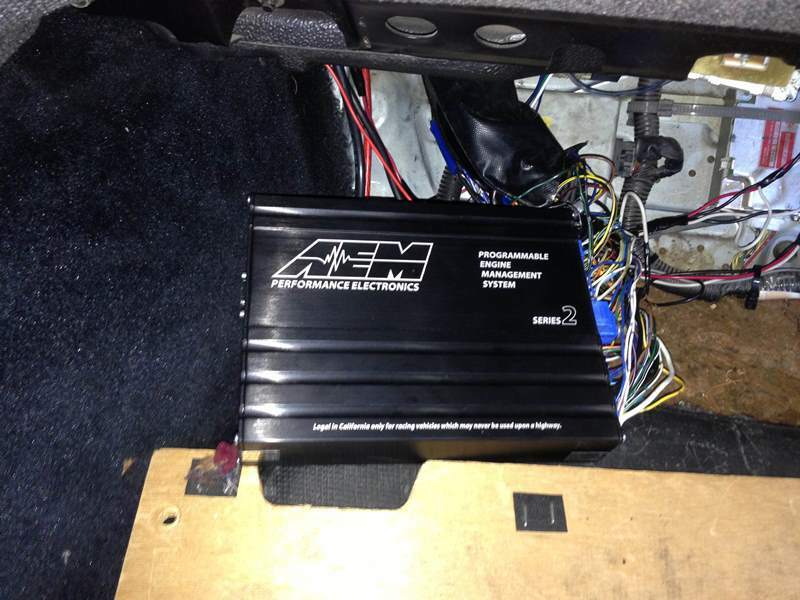 The AEM Series 2 ECU. I have nothing but praise for this ECU. Much better than the Series 1! The Haltech though has definitely won my heart over. We wired the engine’s e-fan to be controlled by the AEM. I mentioned earlier in this article that we saw this Z back in 2011. We have a great comparison of its transformation on the dyno results. The red run was back in 2011 before we performed our magic touch. Blue is how it runs today on standard 91 CA octane fuel. No water or meth. 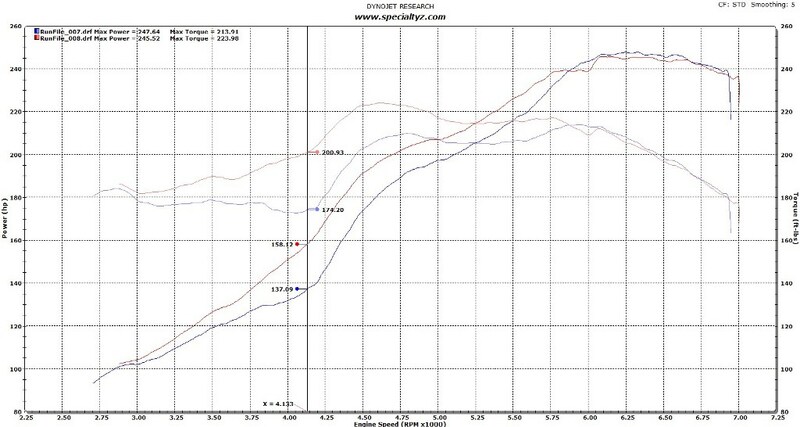 We gained 150 foot pounds of torque at 4500 RPMs and 135 whp! Amazing! This is on the Snow Performance Boost Juice and Kit. We were limited to the amount of boost we could run. Next time we will be adding a Blitz sbc-iD Spec-R Boost Controller. It currently has an Apex’i AVC-R. It had just a spike of 21 psi at 4800 RPMs. By the top of the RPM band we were only at 16-18 psi. It has much more left in it! Congratulations German! Thank you for the opportunity to let us put the icing on your cake!